LAHORE: (Monday, April 10, 2017): Punjab University Department of Botany and WASA Faisalabad have signed a Memorandum of Understanding (MoU) to work on Research and Development (R & D) joint ventures in the field of Environmental Biotechnology for wastewater treatment. In this regard, a ceremony was held at Committee Room of the Vice Chancellor on Monday. 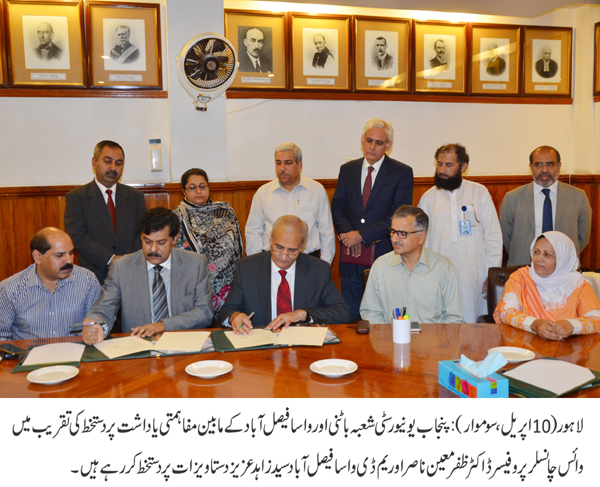 PU Vice Chancellor Prof Dr. Zaffar Moeen Nasar, Dean Faculty of Life Sciences Prof Dr. Naeem Khan, Chairperson Department of Botany Prof Dr. Firdaus-e-Bareen, MD WASA Faisalabad, Mr. Syed Zahid Aziz, Prof Dr. Faheem Aftab, Prof. Dr. Abdul Nasir Khalid, Dr. Shakil Ahmad, Dr. Aisha Nazir, Director ORIC Prof. Dr. Tahir Jameel and the Registrar Dr. Khalid Khan were present on the occasion. 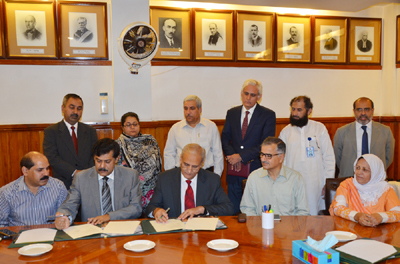 According to MoU, both parties would jointly work on wastewater treatment, establish industry-academia linkages to promote demand-driven applied research and provide customized solutions of municipal sewer treatment for bringing its pollution load well in compliance with the permissible limits set as Punjab Environmental Quality Standards (PEQS). Addressing the meeting, the Vice Chancellor Dr. Zaffar Moeen Nasar said that there should be collaborative research to facilitate living beings, making joint efforts to improve Pakistan’s water and sanitation condition to benefit the community at large. The Managing Director WASA Faisalabad, Syed Zahid Aziz said that WASA will facilitate field surveys to the selected sewerage collection centers, facilitate strategically for installation of Constructed Wetland Treatment (CWT) prototype design developed by the Dept. of Botany at Chakera disposal station of WASA Faisalabad, facilitate establishment of an extension treatment unit of CWT at botanical Garden research station. Chairperson Department of Botany, Prof Dr. Firdaus-e-Bareen further added that there will be a complete support for research collaboration in the field of Applied Phytotechnologies for wastewater treatment for installation of CWT design, research expertise of research mentors and research mentees of PhD, MS and BS level.